Welcome to the first few weeks of Donald Trump’s presidency. There are so many headlines, tweets and images, the media networks are having a field day. We will not be short of news for the foreseeable future, it would appear. In the UK, we are well used to campaigning politicians promising the earth on their election trails, only to conveniently forget about them upon taking office. There was an assumption that many of Donald Trump’s outrageous campaign promises would face the same fate, but we should remember that he is not a life-long politician and has never held a government job. The old rules don’t apply to him. Who knows, maybe he says and does what he actually believes; pretty unique for a politician, no matter how sensational it might appear. 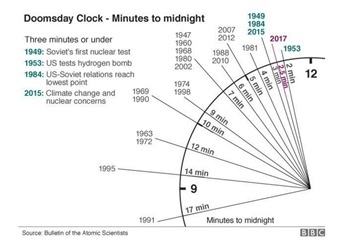 Last week’s adjustment to the Doomsday Clock to 2.5 minutes to midnight, the closest since 1953, was not welcome sensational news. The Clock represents how close we are, in the Bulletin of the Atomic Scientists’ opinion, to a global catastrophe. Since its inception in 1947, it has focussed primarily on the risk of nuclear Armageddon, but climate change has been taken into account since 2007, as well as the potential political climate. It is no surprise that the end of the Cold War in 1991 signalled the furthest point (17 minutes) from midnight. Unfortunately, the outcome of the twice-yearly meeting has had to take President Trump’s policies on nuclear weapons, climate change and the rise of the popular vote into account, which led to the first ½ minute adjustment to the clock, taking it back to a level that was last seen in the early days of the nuclear age where war seemed imminent. As I write, the media is reporting on the chaotic scenes seen at US airports, sparked by the executive order to prevent incoming passengers from seven predominantly Muslim countries. Last week, the headlines were about the President’s announcement of plans to start building the long-discussed border wall with Mexico. ‘America first’ was one of Trump’s campaign slogans. With that slogan, the potential age of globalisation, which may be traced to the collapse of the Berlin wall in 1989, appears to be coming to an end, not just with regards to the US. Borders and fences are being erected everywhere; soon Europe will have more physical barriers on its national borders than it did during the Cold War. According to a recent report, there were 16 border fences around the world in 1989. Today, there are 65 that have been either completed or are under construction.